Rome has long been the centre of Christianity and art and as such, has attracted many pilgrims, artists and travellers – with myself falling into the latter category. 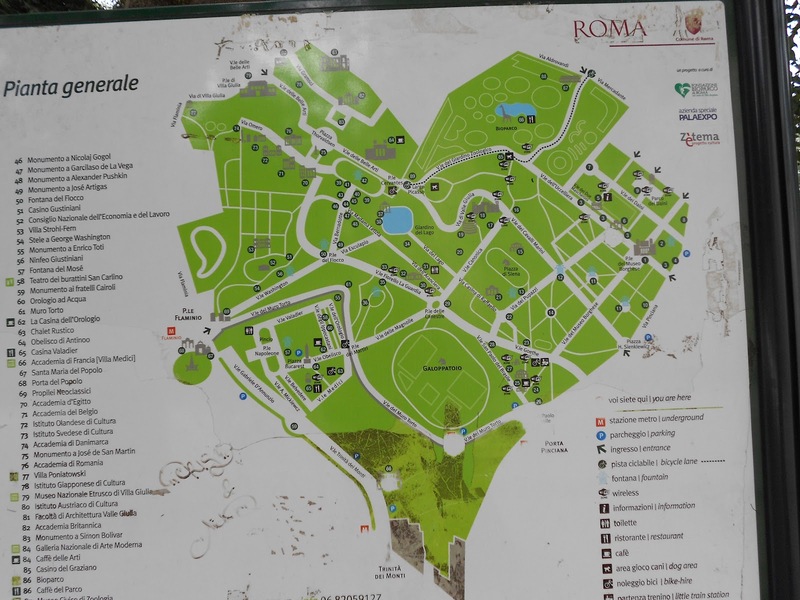 The saying goes all roads lead to Rome and it is with this in mind that I thought we’d take a little walking tour around the Eternal City. Founded as a small village of mud huts in the 8th century BC, Rome rose to be all-powerful by the 1st century BC as it expanded beyond Italy into Spain, Greece and North Africa. After a decline during the Middle Ages the city rallied, bringing some of the greatest Renaissance and Baroque artists to the world’s attention before becoming capital of the unified Italy in 1870. 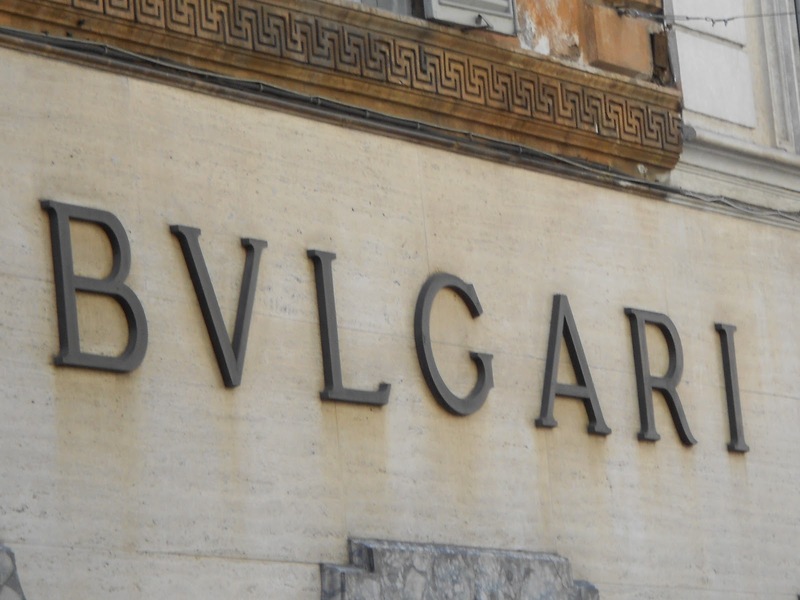 Three main thoroughfares lead from the other side of the Piazza – the Via Ripetta meaning small pier, the Via Del Corso in the centre and the Via Del Babuino which goes straight to the Piazza di Spagna. These were instrumental in managing the flow of pilgrims through the city so let’s have little wander down each one. 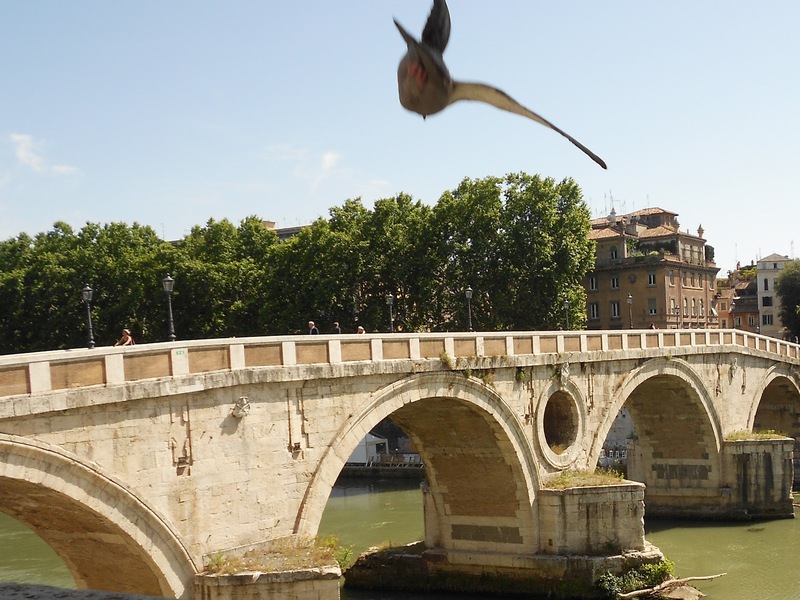 The Via Ripetta takes us to the banks of the Tiber River and crossing at the Ponte Sant’Angelo follows the same route to St Peter’s Basilica that the original pilgims took. But today the magnificent Castel Sant’Angelo dominates our view. The Castel Sant’Angelo has been a safe house for Popes for centuries with the Passetto (or Vatican Corridor) providing an escape route to the nearby fortress. In fact, it proved rather handy for Clement VII who used it to flee from the Vatican in 1527 to evade capture during the Sack of Rome. View from the terrace of the Castel Sant’Angelo over St Mark’s Bastion and the Vatican Corridor with the dome of St Peter’s in the background. Let’s walk back across the river and wander a little further. 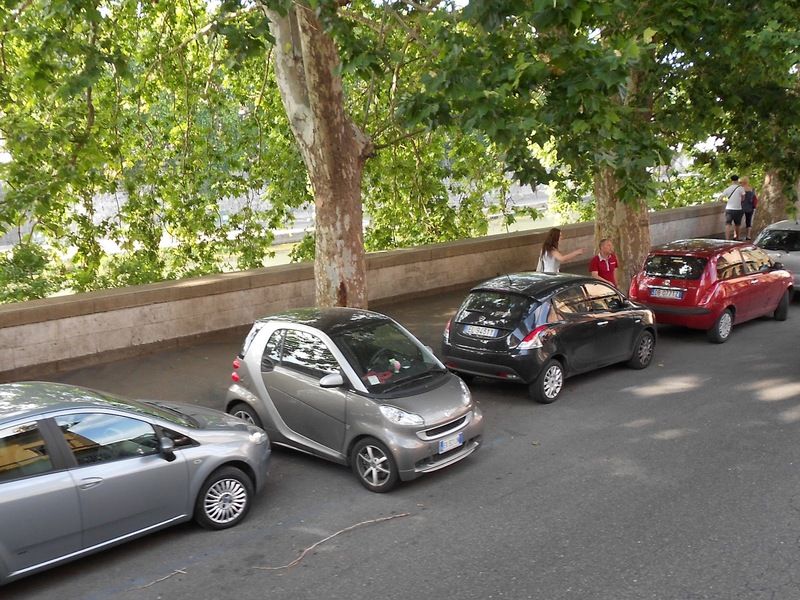 Smart cars, smart parking on the Lungotevere. After 15 minutes or so we reach the Isola Tiberina, an island in the middle of the Tiber River which separates the Angelo and Trastavere areas of Rome. The Ponte Fabricio provides pedestrian access to the island from the Angelo side (where we are) and the Ponte Cestia provides access from/to the other side of the river. 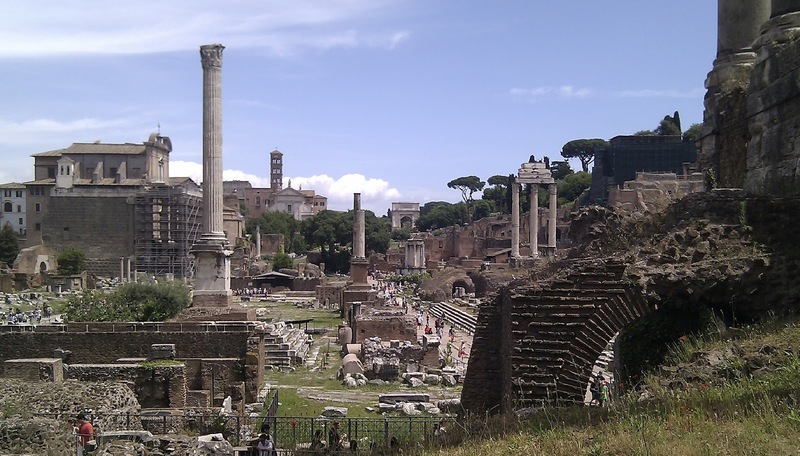 It’s now just a hop, step and jump to the Forum, an amazing complex of temples, government buildings, houses and monuments – or what’s left of them anyway. 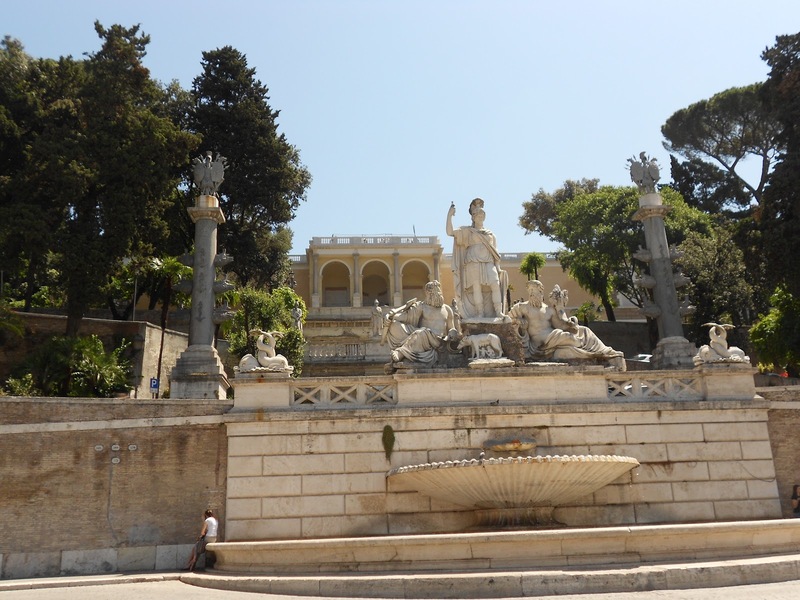 The Via Sacra was one of the most important roads in Rome leading from the Arch of Titus in the east down to the Arch of Septimius Severus in the west. A short walk along the Via dei Fori Imperiali later, we are back at the Piazza Venezia and the bottom of the Via Del Corso. 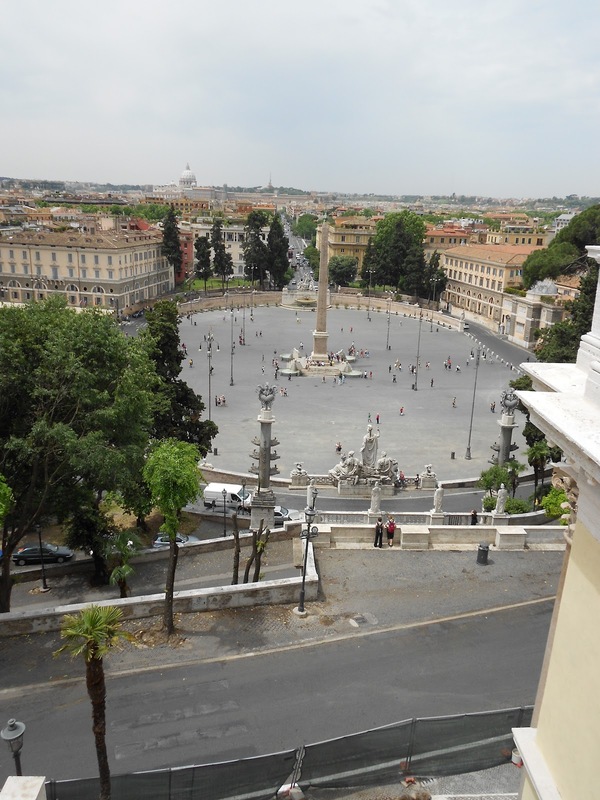 The Piazza lies next to Trajan’s market and column but is dominated by the national monument to Vittorio Emanuele II. 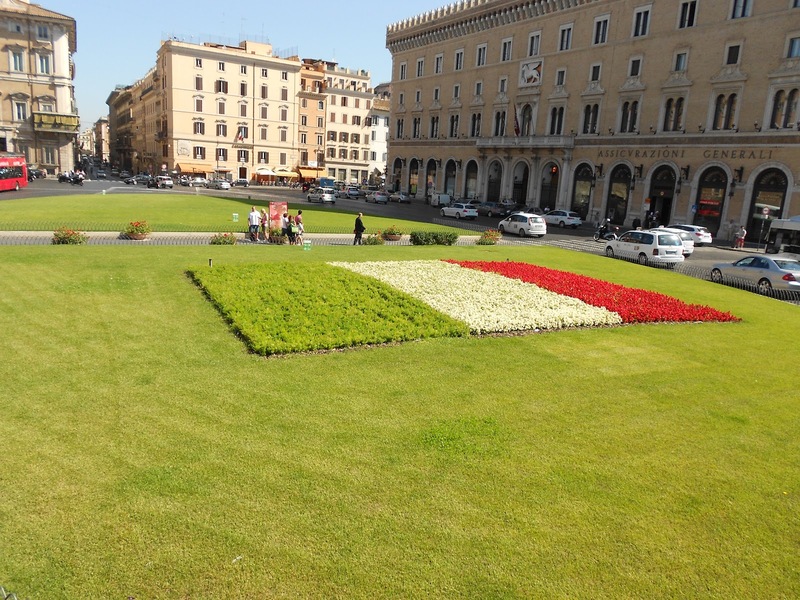 …overlooks a rather patriotic floral arrangement in the Piazza. Setting off north west along the Via Del Corso, we’re heading back towards the Piazza del Popolo but we’ve got a detour to make before we get there. 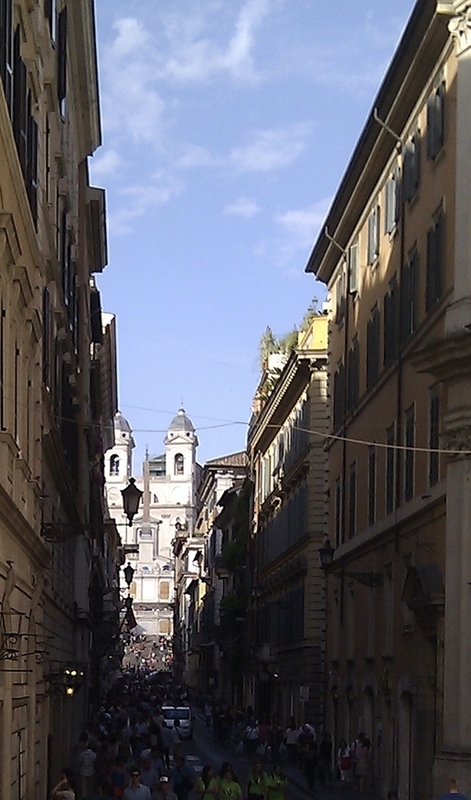 Turning right into the Via Condotti, the Trinite dei Monti looms at the end of the narrow street, overlooking the Piazza di Spagna and the famous Spanish Steps. 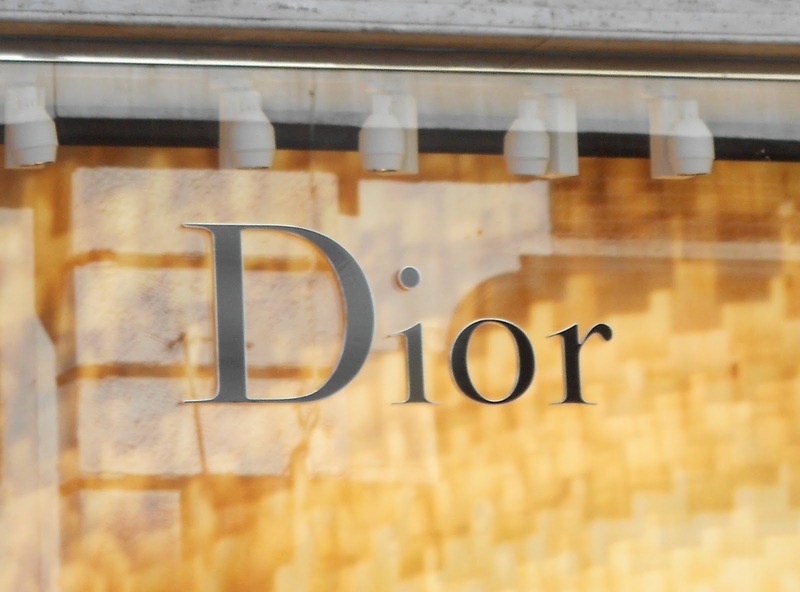 … before stopping to rest our weary legs in the Piazza di Spagna itself. 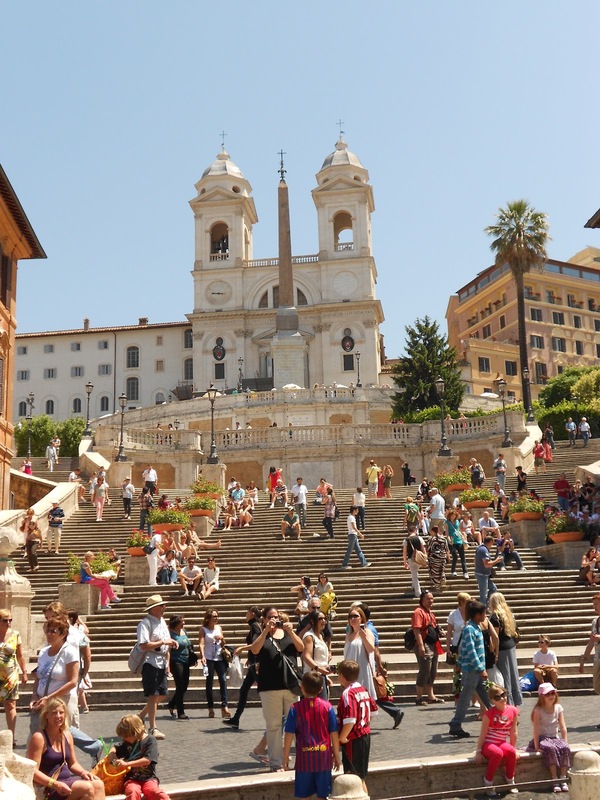 The Spanish Steps, a popular spot to laze in the sunshine. But there is to be no shouting, squalling or singing – there’s a sign that says so. That’s Amore! 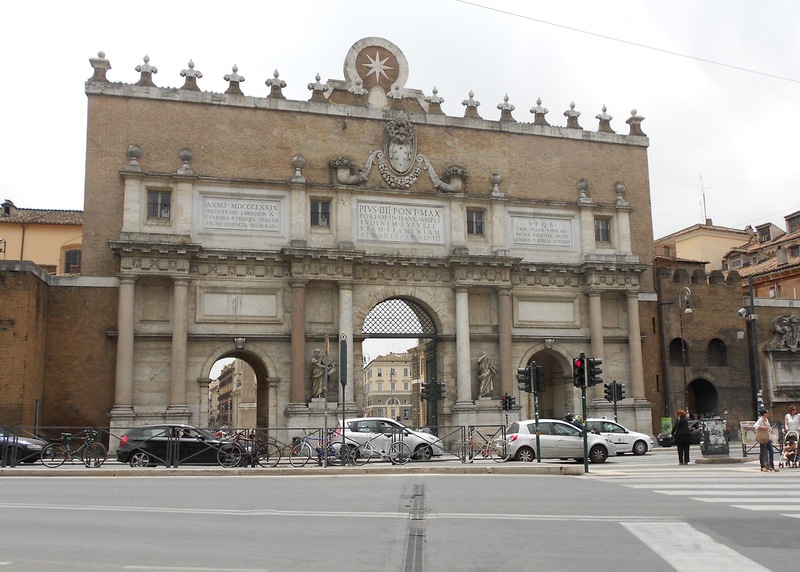 Rested, we now continue from the north west corner of the Piazza along the Via del Babuino until we arrive back at the Piazza del Popolo and the route out to the Via Flaminia, the Porte del Popolo. 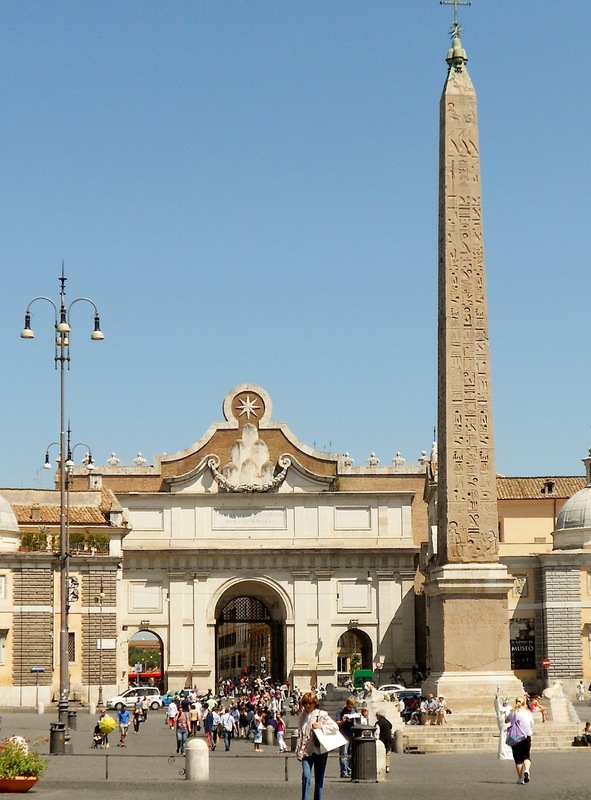 The obelisk in the Piazza del Popolo is over 3,000 years old and was brought to Rome by Augustus to adorn the Circus Maximus. It was erected here in 1589 by Pope Sixtus V.
The Piazza has a chequered past with all manner of gruesome events having come to pass in this neat and ordered space. Like public executions, with some of the condemned being hammered to death by repeated blows to the temples (the last criminal was executed in this way in 1826) and riderless horse races where stimulants, nail-studded belts and fireworks were employed to ‘encourage’ a faster pace from the participants. But enough of all this barbaric talk. 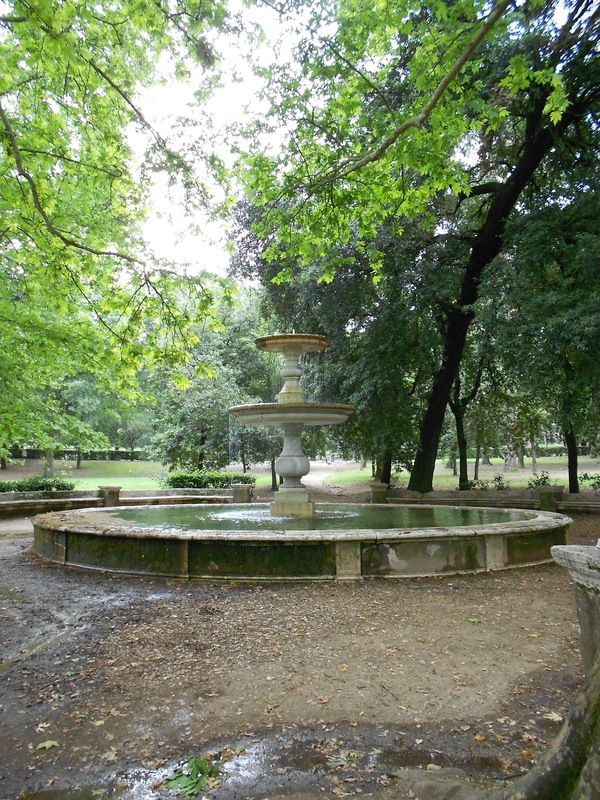 Up to the right of the Piazza lies the Pincio Gardens, a place of green tranquility…and more great views over the roof tops of Rome. 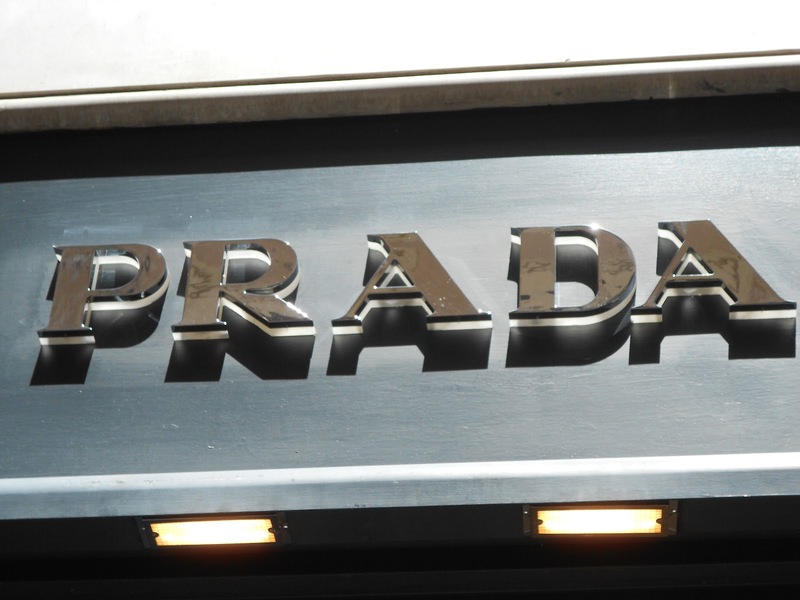 We’ll need to pace ourselves though – the walk is steep. 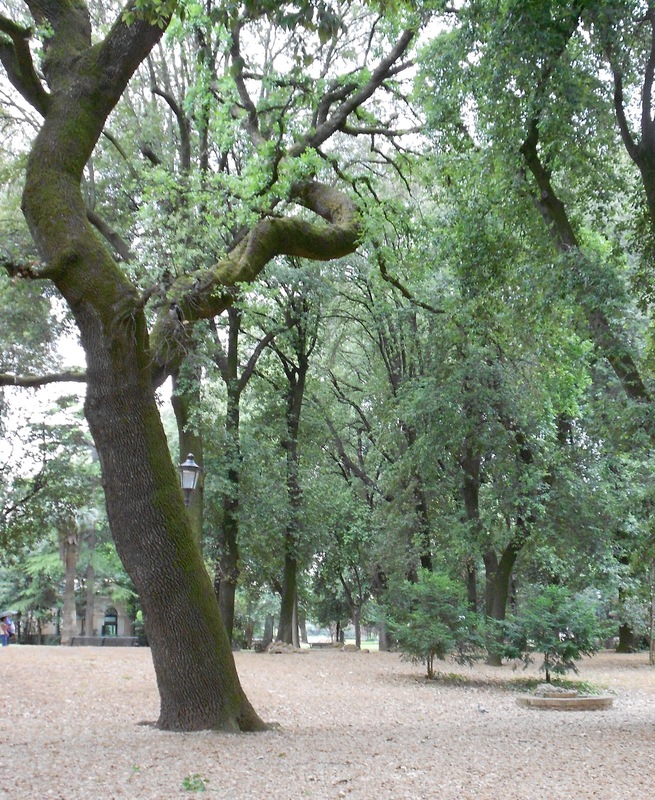 Turning around we face the Pincio Gardens and a short stroll through the trees brings us to the old and the new sitting comfortably side by side. 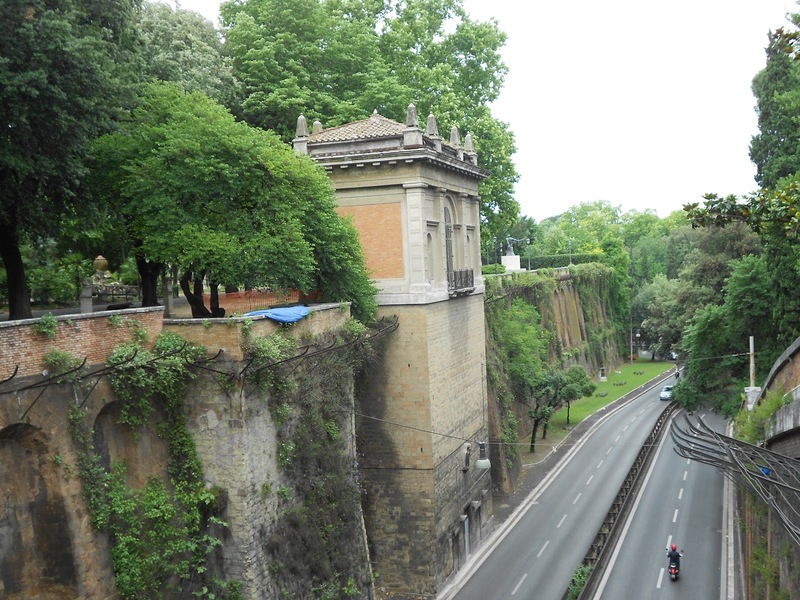 The Viale del Muro Torto, the ‘injured wall’. …a boating we may go. …a peaceful place for us to stop a while. Take a deep breath in and feel the rain-fresh air fill your lungs. Breathe out and listen to the sound of the water running into the fountain. 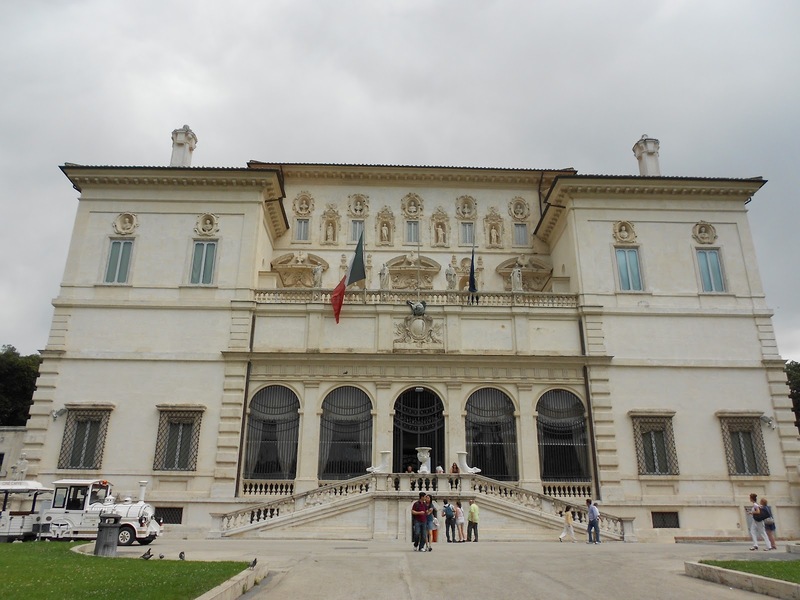 Built in 1605 for Cardinal Sciopone Borghese, favourite nephew of Pope Paul V, the villa now houses the private Borghese collection of sculptures and paintings but you need to book to see it. And so, dear Gidday-ers, here endeth today’s tour. 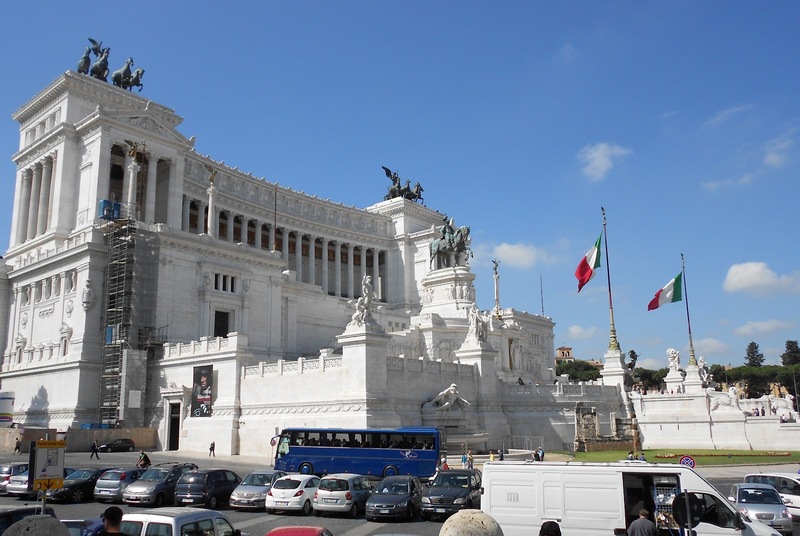 This entry was posted in A Traveller's Life, Armchair Tours, Expat moments and tagged Castel Sant'Angelo, Piazza del Popolo, Roman Forum, Spanish Steps, Tiber River, Via Condotti, Villa Borghese by Kym Hamer. Bookmark the permalink. Ariana thanks! Glad you are enjoying the tour(s). 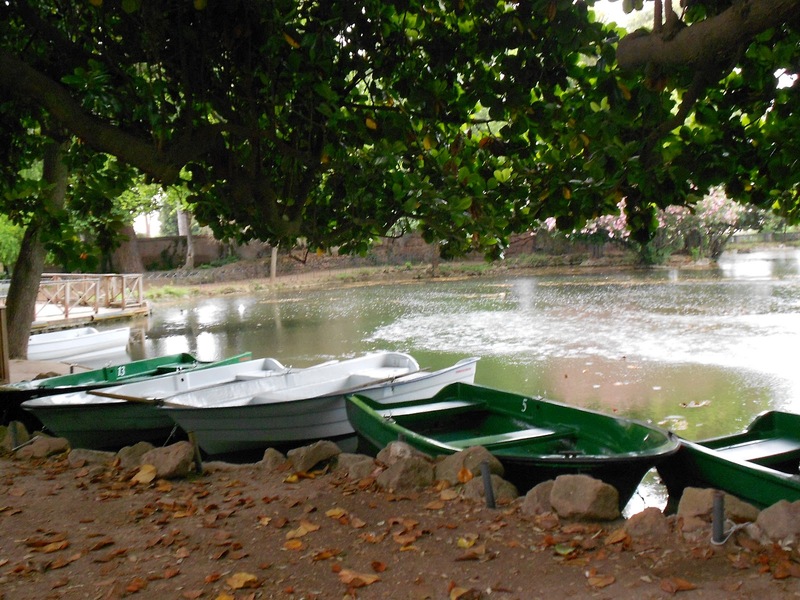 BTW The boats are on the lake at Giardino del Lago in the gardens of the Villa Borghese and I was sheltering under a tree from the rain! 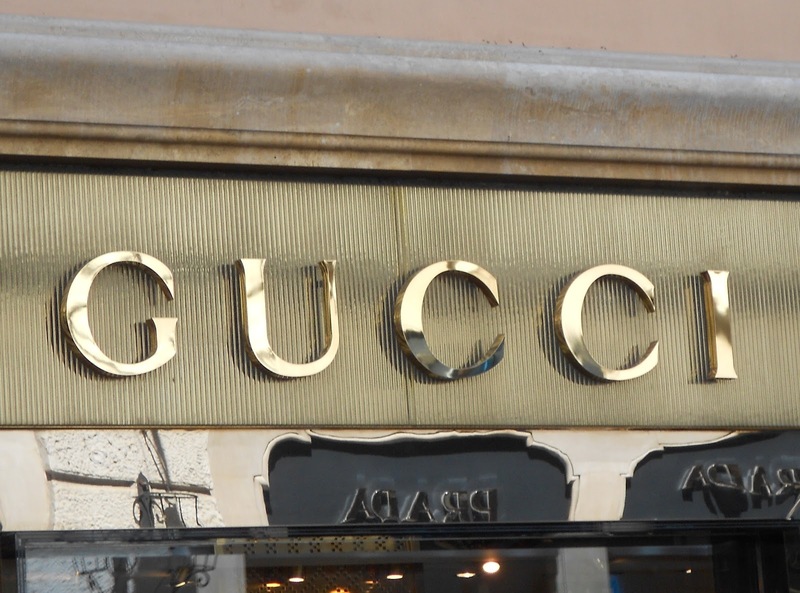 I am enjoying your pictures of Rome! What gorgeous weather, and I love those boats in the canal… I've never been, but it's up there on my list! Great pictures! Makes me want to go back. I'm lazy though and will probably just stick a pizza in the oven and look at your pictures close up.